Who’s that beauty queen in your life?! 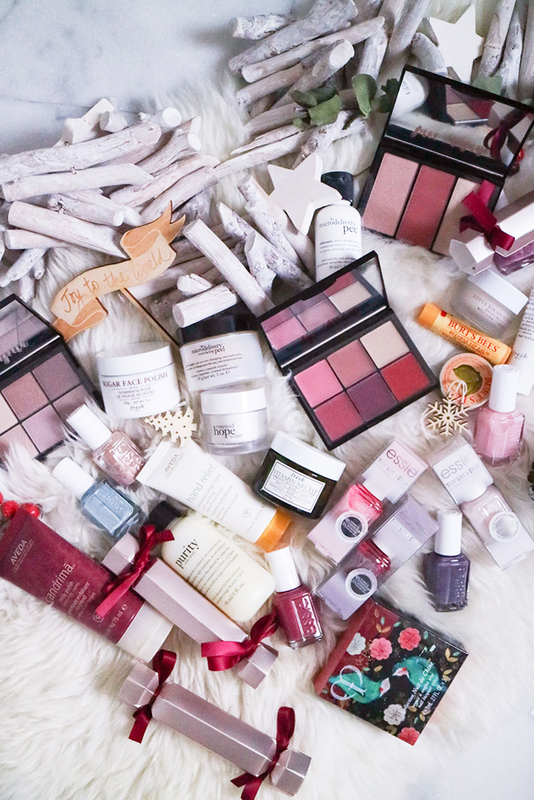 If you’re still shopping for Christmas gifts, I’ve rounded up some of this season’s best gift sets and beauty finds for all your beautiful girl friends! I’ve included products at every price point, so there’s ought something fit for everyone. I’ve been a long time fan of philosophy and during the holiday season, I always look forward to the various gift sets philosophy releases. For the girl friend that loves to treat herself to an in-home spa treatment, I recommend this philosophy Pure Grace gift set. The set contains a shampoo, bath & shower gel, body lotion, and an Eau de Toilette spray. This scent is super approachable and definitely can be worn daily. The fragrance is pure, crisp, and clean with an infusion of water lily, leafy greens and a touch of musk. I love that the shampoo can also double as a bath & shower gel (typically seen in philosophy products) which makes it convenient and versatile while travelling over the holidays. I’ve been using Fresh skincare products for quite some time now and I absolutely adore this brand. My favourite products from Fresh are their scrubs and masks. If you’re buying for a friend that loves to take care of her face, then you can’t go wrong with picking up one of their limited edition holiday gift sets. To new Fresh users, the Best of Beauty Bundle is a great starter pack featuring a full skincare ritual targeted to treat dryness, dark spots, uneven skin tone, fine lines and wrinkles. The set contains the Soy Face Cleanser, which is a bestselling gel cleanser suitable for all skin types, Vitamin Nectar Vibrancy-Boosting Face Mask formulated with 50 percent real crushed citrus fruits and enriched with vitamins C, E, and B5, as well as the Lotus Youth Preserve Face Cream with Super 7 Complex which is a lightweight daily moisturizer that’s targeted to combat signs of aging and boosting radiance. In addition, this set also includes the Black Tea Age-Delay Eye Concentrate which is fab for reducing the look of dark circles and puffiness while moisturizing. 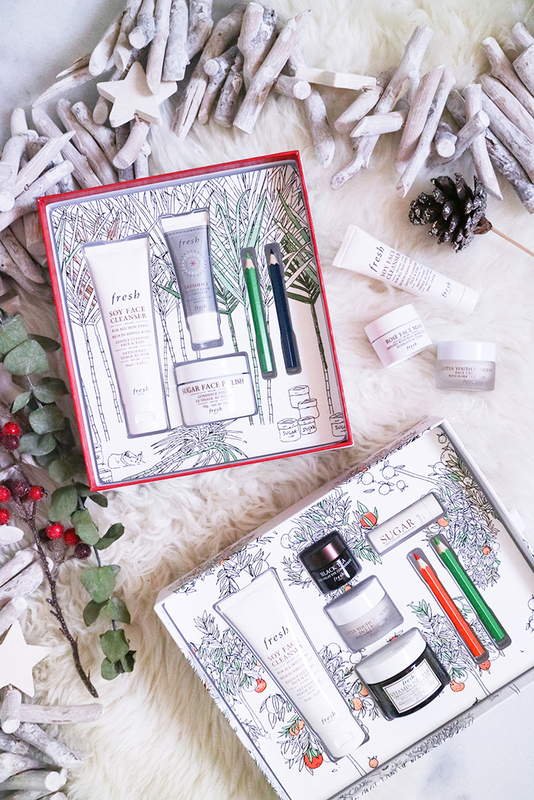 The Fresh Holiday Glow Skincare Set is another great gifting option. This collection includes cleansing, masking, and luminizing products to help with dullness and uneven texture, loss of firmness and elasticity, as well as oiliness. Similar to the previous gift set, this set comes with the Soy Face Cleanser but the Sugar Face Polish (a scrub I absolutely adore), and a Fresh Face Instant Glow Luminizer in Starlight which is also included, perfect to add a touch of party glam. 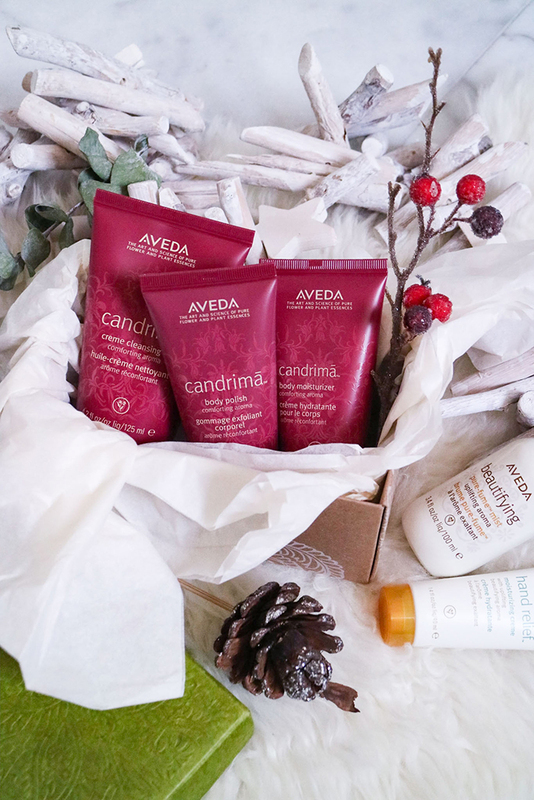 Each year during the holidays, Aveda releases comforting candrimā™aroma, a limited edited scent infused with ginger and ginger lily. This year’s candrimā™ A Gift of Comfort gift set contains a creme cleansing oil, body polish, and body moisturizer. The candrimā™ body care collection is great for a friend who is environmentally conscious. Derived from a plant oil blend including certified organic sesame and coconut oils, the body care collections is said to leave skin soft and smooth. The scent itself is also made from certified organic ginger and ginger lily and other pure flower and plant essences. Most of the hair products I use is from Aveda and I’m so proud to see that Aveda is the first beauty company manufacturing with 100% wind power in their primary facility. Collecting nail polish is what I do! 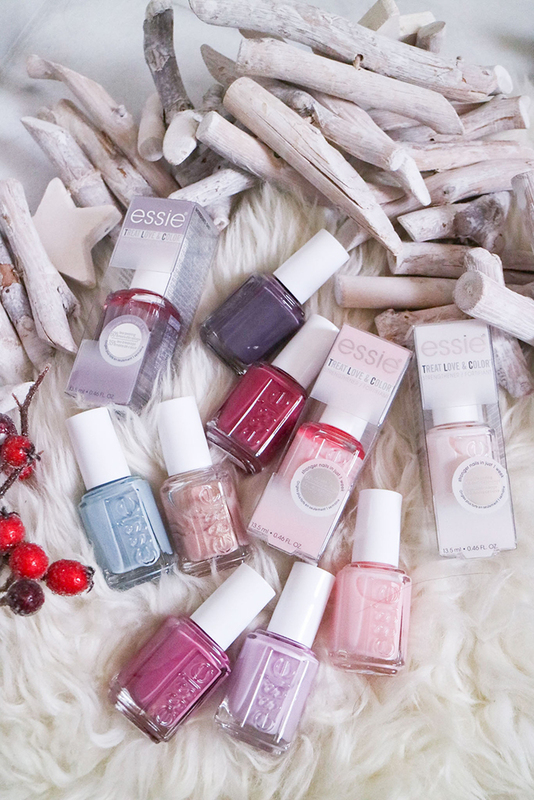 If you have a friend who loves a great DIY manicure at home, then Essie’s Treat Love & Color (TLC) collection might just be the best stocking stuffer. The TLC collection aims to treat nails by giving them an extra boost of strength in just 1 week, 60 percent less peeling and 35 percent less breakage. This collection is infused with collagen and camellia extract and offers the same long lasting wear and instant glow. The Winter months are notorious for causing dry hands and feet. 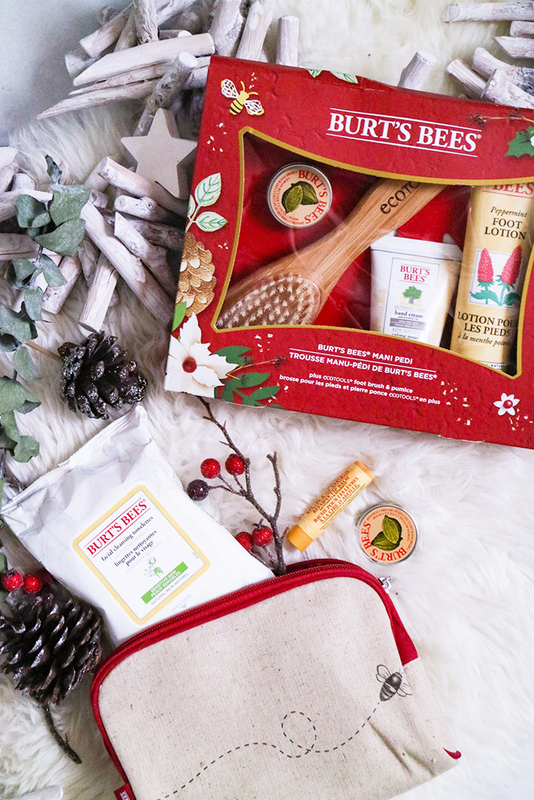 Your bestie will love receiving this Burt’s Bees Holiday Mani Pedi gift set because it’s packed with Burt’s Bees essential to remedy dry hands and feet. This gift set includes the Peppermint Foot Lotion which soothes, revives, softens feet providing great comfort after all that Christmas shopping and walking! The Ultimate Care Hand Cream, formulated with baobab oil, pumpkin seed oil and green tea extract is great tucked in the purse to provide all-day moisturization for extreme dry skin. Lastly, this set also includes a Lemon Butter Cuticle Cream which is great to moisturize and soften cuticles during these harsh months. I love the fresh lemon scent that this cuticle cream offers and the fact that it is formulated as a cream rather than an oil. Entered a Secret Santa gift exchange and not sure what to get? The Quo Cosmetics holiday collection, available exclusively at Shopper’s Drug Mart has you covered! The collection carries an impressive array of gift sets ranging from lipsticks, brow kits, blushes, brushes, to super cute advent calendars! The price range is also incredibly affordable making these sets a great option for gift exchanges and stocking stuffer ideas. Among the collection, I love the Quo 12 Days of Beauty gift set, Quo Roll and Go Brush Kit, and these super adorable Quo Cosmetics Crackers! If you’re still working through your Christmas shopping list, I hope these were some great options for you to consider!